At Broken Arrow Farms there are people who come and stay at the farm for a few days to a week for pheasant hunting, and there are the day hunters who come out to the farm for the hunting but stay in town to take advantage of the restaurants and entertainment it offers. It also includes some of the locals of Pierre, South Dakota who hunt there as well. I was one of the hunters who chose to stay at the farm house. The first day of hunting was comprised of about 14 hunters that were friends, relatives or neighbors of Mark Hugen, the owner and manager of Broken Arrow. This is an annual event where they get to come out to have some fun. It was the last few days of the season and there were still plenty of roosters out there that had been missed by earlier hunters. We usually split into two groups, the walkers, who were usually the larger group and the blockers, who would stand at the end of the fields being walked to prevent any pheasant from running or flying away. We hunted several different areas all in a different direction from the ranch and in different types of fields from milo and corn to different grass fields. For the first two hunts in the morning I was a walker. I enjoy getting out and walking through the cover seeing the countryside and waiting for a bird to make a break for it. The birds seemed to go up everywhere but where I was walking. Luck of the draw. I chose the routes I walked so I have no one to blame but myself. On the third hunt I decided to block and got my first rooster. From then on I decided to alternate and walk one and then block one hunt. Now when I was walking a hunt I was getting birds flushing close to me and got a couple more. The rest of the morning I got a couple more roosters and felt a little better. After a short break for some refreshments we drove to another area and headed out for another hunt. As soon as you got close to a field you were going to hunt, hens were starting to take off by the hundreds. I have never seen so many hens leaving fields as here. It was rather unique. What was interesting is that the roosters would almost always hold tight until you got real close before they flushed. Big mistake for the roosters. Everyone got a few more birds in the afternoon series of hunts. When I saw the dog carrier where everyone was placing the birds, it looked like we got somewhere between 75 and 100 birds. It ended up being a great day. When we got back, Mark decided to show the few of us that hadn’t seen it before, his bird-raising operation. From the hens laying eggs to the mature birds ready for release, it was a very interesting operation to see. There were chicks in every stage of development, from the egg just having been laid, to the incubator eggs, and to see chicks hatching as we walked by, to the few day old chicks that looked like they should be setting atop an Easter cake. There were eight incubators that hold a total of 5,000 eggs. They normally have a hatch of 15,000 chicks and sell quite a few and keep all the chick roosters for the coming year’s hunts. They will usually gather 45,000 eggs during the hatching season and some are sold to a neighbor who is also in the business. During this past hunting season over 4,000 birds were harvested on their farm. They also breed hunting dogs and sell puppies and started dogs and do regular training of dogs. 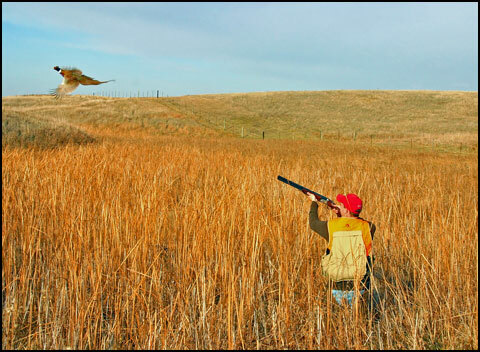 They have over 35 dogs that are used during the South Dakota upland bird hunting season. At the end of the day, everyone gathered in the main building and started grabbing beers from the large cooler room. I spotted a favorite of mine, Blue Moon, and popped the cap. Norm, one of the hunters, got busy on the deep fryer. Someone grabbed a tray from the large cooler and uncovered a great selection of cheeses and a few different varieties of pheasant sausage. There was also a large selection of salty snacks. Mark’s daughter brought in a large jar of pickled pheasant eggs. The feast was on. It was fun recounting the hits and misses of the day. A few minutes later Norm brought in the first batch of pheasant nuggets, which were delicious. I asked him about his batter, and he told me he’d have to shoot me if he told me. Then I advised him he’ll never see my pheasant fajitas recipe. That changed his attitude. Norm did about eight or nine batches of pheasant nuggets, and they disappeared as fast as he could make them. After an hour or so people started to head back home and the few of us left finished off the last of the food so there wasn’t much of a cleanup. Mark asked me if I wanted to do a morning hunt the next day. It was very tempting, but I had a long drive home. Broken Arrow is located about 14 miles northeast of Pierre, South Dakota, north of Highway 83 and 14. There are signs at the road #299 to direct you to the farms and on the dirt roads to the lodging and headquarters. They operate on over 2000 acres of prime farm land that is flat, so no need to worry about climbing steep terrain. They have been in operation for over eleven years and get a lot of repeat hunters from the photos I’ve seen. That speaks well for any operation. 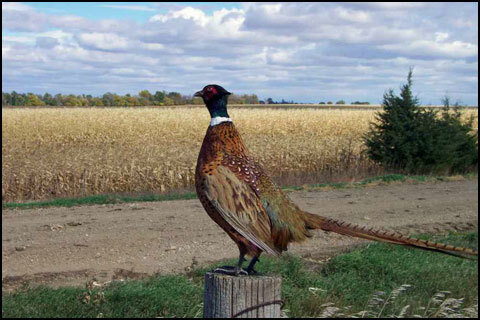 On the few trips I made between the farm and Pierre, I’ve seen pheasant everywhere along the roads and fields. I had never seen that before. It was a great experience with a lot of birds to shoot and new friends made. It’s a place I’d like to get back to and spend a little more time there. Jerry Sinkovec is a freelance outdoor and travel writer/photographer who writes for over 45 different publications nationally and internationally. He is also the director of the Browning-endorsed Instinctive Target Interception Shotgun Shooting School headquartered in Idaho Falls, Idaho. You can contact Jerry Sinkovec by visiting his web site at http://www.itishooting.com.